In this address, H.M. Hoxie, First Vice President of the Union Pacific Railway Co. of St. Louis, Missouri, informs the employees of events that have led up to the strike involving several railway systems throughout the country. On December 16, 1885, the United States Court took possession of the Texas and Pacific Railway making the employees of the railroad employees of the agents of the court. In March, 1886 these employees inaugurated a strike and the Knights of Labor notified superintendents of the railroads down the line that they would appoint and place their own watchmen to protect railroad property from loss and damage. 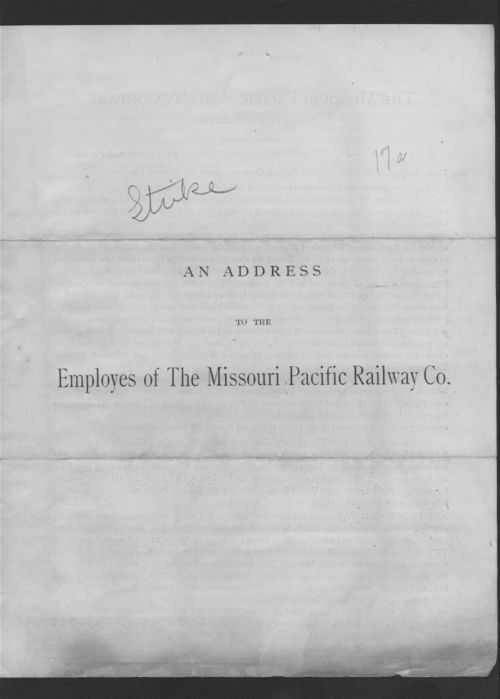 An address to the employees of the Missouri Pacific Railway Co.